What if I told you that your life insurance can help you save money when you purchase healthy food? That’s right! 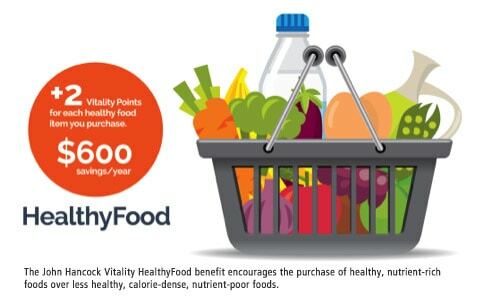 John Hancock Life Insurance with Vitality and their new HealthyFood benefit does just that — saving policyholders up to $600 a year just for making healthier choices at the supermarket. Talk about being proactive! I love this concept! 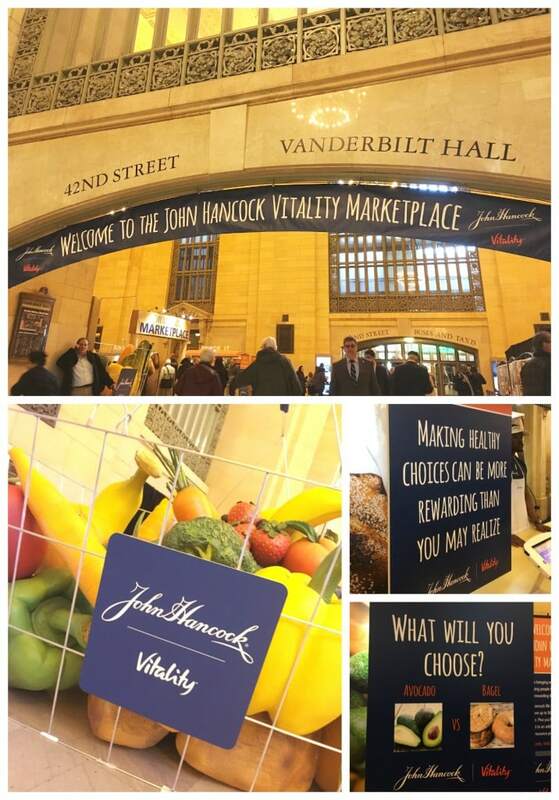 I was so happy when I heard that John Hancock was having a pop-up event at Grand Central Terminal in NYC last week. 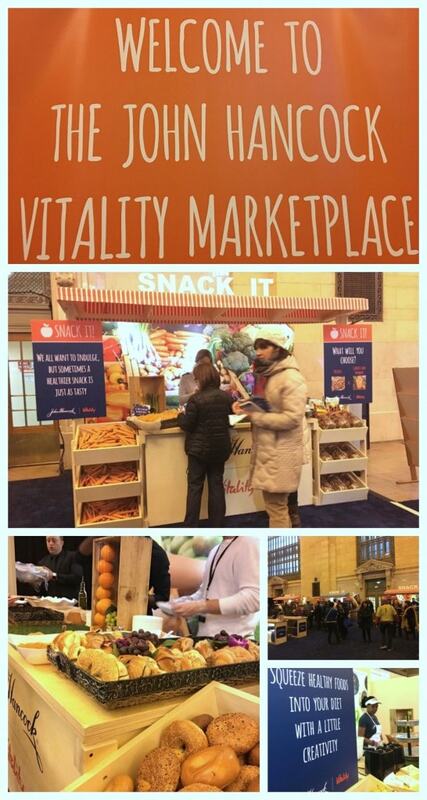 I jumped at the chance to learn more about what their John Hancock Vitality Marketplace event had to offer me and other people interested in life insurance. Many of us know the basics of eating healthy, but in the moment, it can be tough to make healthy decisions. 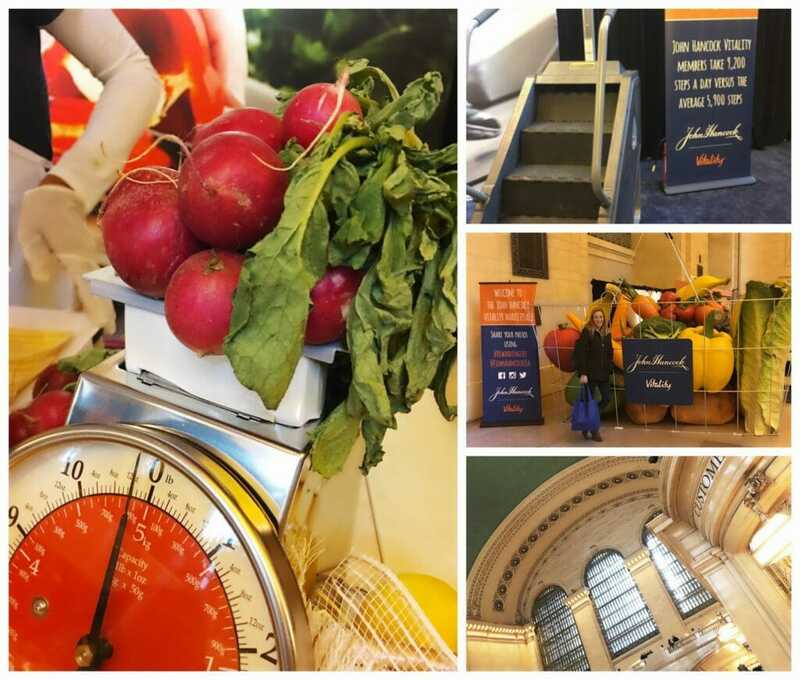 That’s why John Hancock brought those everyday food choices to life with this activation event. This wonderfully interactive market – which was filled with stations – asked patrons a simple question; Which is the healthier decision between A and B? Would you rather climb on a stairmaster for 5 minutes or sit in a massage chair for 5 minutes? I actually asked the person in charge of the station if ANYONE was picking the stairmaster – and believe it or not THEY WERE! But sometimes, the answers weren’t so straight forward. Personally, I thought both options were healthy options, but I was informed that the hummus and carrots were the better choice. It’s not just about caloric intake, it’s about nutritional value as well. Upon completion, I had the chance to interview Michael Doughty, President and General Manager, John Hancock Insurance, and he really opened my eyes to the benefits of John Hancock life insurance with Vitality and the new HealthyFood program. Last year, John Hancock changed the way people thought about life insurance with the introduction of John Hancock life insurance with Vitality, an innovative kind of life insurance that rewards people for the healthy choices they make, like exercising, seeing your doctor, and now, purchasing healthy foods at the grocery store. With the new HealthyFood program, not only will you save up to $600 a year on the nutritious foods you buy, but it can also help you save on your life insurance premium and earn valuable rewards and everyday savings for those healthy food purchases. If you walk just a little bit further and if you choose to eat a little bit healthier, then you can lower your premiums if you have this insurance. Why wouldn’t you walk that extra mile? I simply ADORE this structure! It makes me want to get up and move just WRITING ABOUT IT. Visit JHRewardsLife.com for more information, and remember to choose healthy the next time you find yourself in the grocery store! This sounds like a really great program! And I am always looking for things to help me live a healthier lifestyle. I love the idea of earning rewards on healthy choices. The potential to save is a great way to encourage me to take better care of myself. I’m all about living healthy. It’s so nice that you can earn rewards for choosing to be healthy. Policyholders save money just by making healthier choices at the supermarket?! It gets no better than that! I am all for living healthier. I wish ours offered something like this. Makes sense – healthy choices will make you live longer, so your life insurance won’t kick in until later! Many people don’t realize the importance of having life insurance for unforeseen circumstances. It’s imperative to make financial arrangements for one’s family should something happen to them. Omg love this!!!! A step in the right direction that’s for sure. I wish healthy choices earned rewards where I live!